Welcome to our weekly Grey's Anatomy Round Table discussion! Courtney: Favorite quote had to be Sloan once again defending Lexie... ”Don’t count out Lexie Grey until you meet her. She’s smart, she’s beautiful, she’s perfect.” So are you McSteamy, so are you. Sean: I’m all about those small moments like the simple look between Meredith and Cristina. It says something of their lasting friendship and ability to say everything while saying nothing at all. Those two are such a team. Christina: I loved the itsy bitsy spider + MerDer + Zola scene. I might've shed a tear. Debbie Allen guest starred as Jackson’s mother. Would you mind seeing more of the genius that is Catherine Avery? 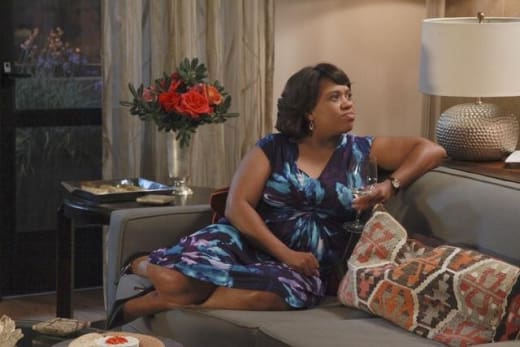 Courtney: I thought Momma Avery brought some fun to the hospital and wouldn’t mind seeing her show up again. Maybe a run in with her baby boy’s girlfriend... could be a lot of fun. Plus she makes for a good sparring partner for Sloan. Sean: Yes! Her presence is a strong one and rather fun to watch. She says what she thinks and her scenes were a positive addition to the episode. Plus, if she ever gets to meet Lexie? Oh, that will be something to see. Christina: Most definitely! She obviously made a huge impact at SGMW, and I'd love to see her interact with her son's "smart, beautiful and perfect" girlfriend. Bailey’s Big Decision - Ben or Eli? Courtney: I’m going with Ben. He waited for her, he even went Off the Map (see what I did there! Ha, I had to). Even though Bailey wasn’t ready for a relationship with him, she still thought about it. That’s more than she can say for Eli. Ben is right, it definitely has something to do with him. Sean: Don’t let him walk away! Pick Eli! Oh, okay, I’m a little biased because I liked Daniel Sunjata in Rescue Me. That said, I see sparks with Bailey and Ben. Now, when will those two get together? Christina: Ben! Although Bailey didn't want to admit that her break up with Eli had anything to do with Ben's return, we know what's up. It can only be a matter of time 'til the B&B are back in business. Will Meredith and Derek get Zola back? Do you want them to? 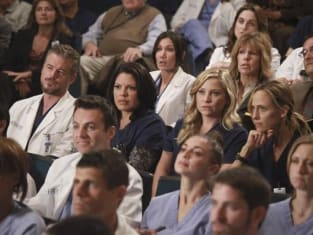 Courtney: I love my Meredith Grey dark and twisty, but between a miscarriage, the loss of her adopted baby, and trouble with her marriage, I’m not sure she could take it. I’d be good with the two of them getting their girl back, as long as it doesn’t take over their characters. Keep the story somewhat in the background like they do with Sophia. Sean: I’m not sure, but I like to think that in the world of Grey’s Anatomy, everything will work out right for those two. I think Zola will have a huge impact on their relationship future either way. Hopefully the experience brings them together rather than pulls them further apart. Christina: I completely agree with Courtney. MerDer totally need and deserve baby Zola. Plus, I want to start using the term McFamily. Who’s the most underused character of Season 8 so far? Courtney: Callie for sure. She used to have all these great friendships with Mark and Cristina and even Teddy. Now when you see her, its for a few minutes and it is usually with Arizona. I’d be good with even seeing her do one of her rough and tough surgeries. Sean: I agree about Callie, but I also feel Lexie has barely been in any episodes. She appears for a moment or is mentioned, but really she just isn’t there. And she’s dating Jackson! Why all in the shadows, sister Grey? Christina: Callie has certainly been the most underused. Last season it was all about Calzona. That really seems like a decade ago though.